How much network cable is in use around the world, good question and one that's hard to answer but one look at www.submarinecablemap.com and of course a peek into the walls of the average home or office anywhere in the modern world and it's easy to understand that it's a lot. While it's true that the backbone of internet itself is comprised primarily of Fiber Optic the vast majority of what actually gets those 0's and 1's from A to B is copper network cable. While we could get into the history of Networking cable and the evolution of the technology etcetera it's more relevant to focus on what's being used today and hopefully answer some questions you may have along the way. That said we'll look at CAT5, CAT6 and CAT7 the differences between them and the variants each has to offer. 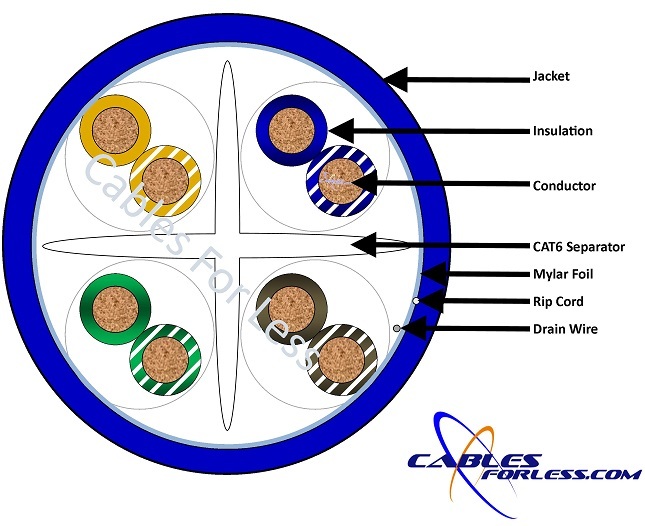 CAT5 cable has been around for quite some time now and for the history of it detailing things like bending radius and other specifics you can always visit https://en.wikipedia.org/wiki/Category_5_cable while not the definitive answer on all things CAT5 it covers most of the basics. CAT5E is what is widely used today and honestly it is able to meet the needs of most homes and small business when it comes to speed and ease of use. Bulk CAT5E is commonly available in 1,000 pull boxes and spools in the following variants, each with a with a wide range of colors to choose from. CAT5E - Solid Solid CAT5 cable is without doubt the most common cable in use today, this is ideal for most applications in the home or office. It is intended for installation in walls, ceilings etc. Standard solid cable is easier to work with than stranded, shielded or plenum due to the lack of protective layers of metal foil or other measures the other types mentioned utilize. It is great for working with when using crimping tools, punchdown wall plates, patch panels, etc. Solid CAT5 is the most readily available and therefore the least expensive option offered. CAT5E - Stranded Stranded cable lends itself to being a bit more flexible and therefore better when used for patch cables and shorter runs in general. Because each of the 8 wires inside that transmit your data is using several smaller copper wires instead of the one solid wire it can bend easier but as such tends to be more expensive to manufacture and a bit more difficult to work with as well. Some people make the mistake of not educating themselves and just assume it's a better quality product but end up returning it which is of course not cheap either. CAT5E - Shielded STP stands for Shielded Twisted Pair which is a type of cable that provides excellent shielding against electrical interference by wrapping the wires that transmit data in a mylar foil. (think of it as a tin foil hat for your cable!). STP cable is great when working in drop ceilings where the interference from lights and other electrical wires can cause cross talk and problems that slow down data traffic. STP cable comes in both Solid and Stranded. Plenum rated cable is the most expensive version and designed for use in air conditioning and ventilation systems. Essentially if the building it were installed in were to catch fire and thus the cable running through the air ducts of that building, it's flame-retardant properties would not emit the same amount of toxins that the non plenum cable would. You should always check the local building codes to determine if Plenum cable is required in your area. So while CAT6 is able to to deliver higher speeds by using the measures mentioned above those same measures can make it more expensive and a bit harder to work with. Of course it's a given that with the thicker gauge wires used with CAT6 all of the tools and accessories such as the punch down blocks and patch panels will need to be designed to work with CAT6. One thing worth pointing out is that your connection is only as fast as the slowest piece in use. For example if you actually manage to crimp a CAT5 end on a CAT6 cable (not easy but we've seen it done) while you may or may not notice a difference chances are it won't be as fast as it should or could be. Still CAT6 cable is widely used today and with a complete set of tools and connectors available to work with is not as hard as one would think, it simply take a bit more time to work with and of course the investment is a bit more as well but not being able to predict the future many people are going this route so they are set for years to come and we can't blame them. Even if you've not got every end crimped down perfect or the best wall plate or switch being used simply knowing that the cable that runs through your walls, crawl space and attic won't need to be replaced in a few years when your streaming cute cat videos at 16k... is comforting to say the least. Cat6 - Solid The most common form of CAT6 cabling in use, ideal for in wall installation in the home or office. Cat6 - Stranded Stranded CAT6 cable is not very widely used as it can be rather difficult to work with if you are inexperienced or do not have the right tools for the job. Cat6 - Shielded CAT6 STP (Shielded Twisted Pair) comes in both solid and stranded versions and is ideal for installations that deal with high interference and data loss from nearby electrical lines or other devices. 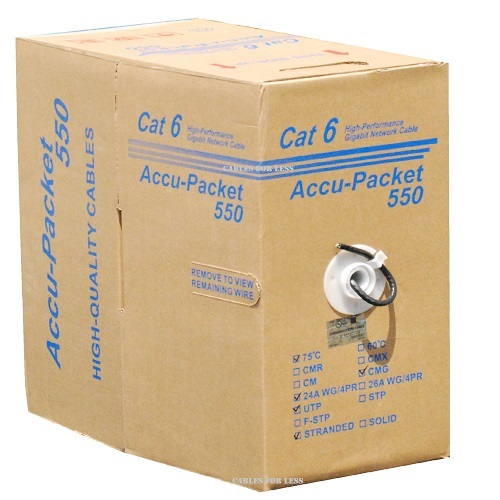 Cat6 - Plenum Plenum rated CAT6 cable comes in the regular solid version as well as shielded for the utmost assurance that you've got the best stuff out there, but brace yourself for sticker shock, as it's also one of the most expensive we offer. CAT6A as well as CAT7 Cabling have both been around now for years but to some extent they are each pushing the envelope of what copper cabling is capable of and and to a degree rival the cost of fiber optic technology so it has neither have been embraced the way it's predecessors have. Because of the complicated nature of working with these types of cables given that to truly reach the speeds that qualify a cable as CAT6A or CAT7 we currently do not offer either in bulk form as very few people have the ability to meet the specifications when working with these products using hand tools etc. Of course we do carry CAT6A patch cables as well as CAT7 Patch Cables and one day may offer each in bulk but at this time we simply do not. About Copper Cladded Aluminum otherwise known as CCA - we do not offer it, never have nor will we. Reason being is that it can not match the real copper cable in any way, the only thing it can do is to supply cable at a lower cost. It's like saying you bought a Ferrari, true it's a little toy car your kid rides around in but it still looks like a Ferrari and while you can still call it one... it's really not and the performance is obviously a tad different. Why so harsh, well we feel CCA cabling is horrible and we're not alone, no one can certify it, every governing body as well as manufactures such as Belden or even Fluke Networks who build some of the best testers around all say that CCA is something to avoid. They are not compliant to any industry standard nor do they meet safety requirements. Sure it's cheaper but at what cost? Thank you Belden for the following explanation (found here) as well as putting together a very helpful video tutorial explaining the differences in the many types of shielding available today. We understand that it can be a little confusing and hope this information helps to clear things up a bit! This cable is not shielded at all, and is the common unshielded cable most often referred to as UTP cable. Specialty cable for uses such as outdoors, aerial or direct burial are also available but typically do not come in the wide array of options and colors the rest do. If you do purchase network cable in bulk you're sure to need some of the tools and accessories we carry as well. We offer a full line of cable ends, boots, crimpers and punch down tools as well as wall plates and patch panels.